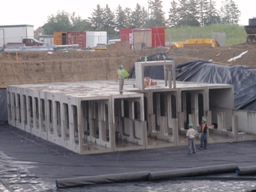 Concrete detention chamber systems or tanks are much more expensive to construct than stormwater ponds. Consequently, they are rarely used for stormwater control if space for a pond or wetland is available. However in densely developed areas where space for surface stormwater management facilities is scarce or highly valued, underground treatment practices like detention chambers and tanks may be the only feasible option. Stormwater of combined sewer overflows detained by these facilities may either flow at a controlled rate to downstream sewers and receiving water or conveyed to water pollution control plants for further treatment. Like detention ponds, when the inflow volume exceeds the capacity of the system, the overflow typically drains directly to receiving waters or is pumped off shore.